... we celebrated the Hanukkah in Girona. It was eleven years ago now, in 1998, that an extraordinary event took place in Girona: the public celebration of Hanukkah at Torre Gironella, a location with symbolic associations for the city's Jewish past. The celebration was organized by the Jewish communities of Barcelona, Perpignan and Berlin, who chose Girona for various reasons: partly geographical, as an ideal meeting-point for the three cities that had promoted the initiative, but also of course for the historical interest of its rich Jewish heritage. The original proposal was warmly welcomed, and the then Mayor of the city and Chairman of the Call de Girona Municipal Board, Joaquim Nadal, made only one request: that it should be a public event that would also be accessible to the people of the city. The celebration brought together at least a thousand people of different beliefs and cultures. The ceremony was presided over by the Grand Rabbi of Rishon LeZion (Israel), Mr. Eliahu Baksi Doron, the highest religious authority of Sephardic Judaism. 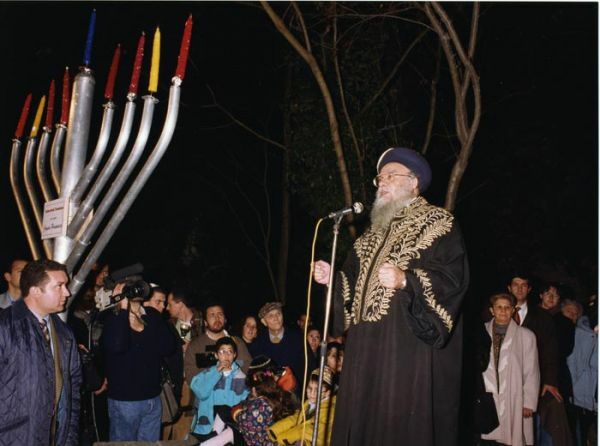 This took place on 20th December 1998, the last day of Hanukkah, and the Grand Rabbi lit the candles on the eight arms of the imposing 3 metre-high candelabra that had been loaned for the occasion by the Jewish community of Toulouse.